"In Timaeus 35. Plato began his account of the method by which God constituted the Universal Soul from the "Same and Other", which being naturally difficult to mix, were brought together through the medium of a third, "Essence". I previously made a reference to this work in the Alchymical Wedding ceremony of the Celestial King and Queen section that associated this work of Plato's to the later medieval process known as alchemy. John Michell gives the values of the three components to this process as, "Ta Auta kai ta Etera"-The Same and The Other, which has the separate total of 1746, or 666 + 1080. And when the third component called Essence is added, it equates to the phrase, "Tauton, Thaterou kai Ousia", which totals 2368. Now where have we seen that value before in this production? That this phrase value should equate to the Christian holy name "Ihsous Xpistos"-2368, more than four hundred years prior to the advent of Christianity is hardly a coincidence I think. In the years following the death of Plato, his most celebrated pupil and successor, Aristotle, would later tutor one of the most reknown rulers of the ancient civilized world, "Alexander of Macedonia", thus spreading the ideas and concepts of Plato and others, throughout what would later be described as the Hellenized world, which of course included the kingdom of Judaea or Israel. Now am I just imagining things, or does Plato's cryptic medium reference of "Essence", resemble an offshoot branch of Judaic culture called "Essene", that would become the cradle of this new religion called Christianity a few centuries later? Although Alexander's new empire would be rather short lived, broken up by his generals into four main subdynasties, these would still maintain a high degree of cultural and commercial exchange between them. One of the most interesting subdivisions of this empire is that of the Ptolomy's of Egypt, concerning the amalgam or merger of the Greek and Egyptian deities in Alexandria named "Serapis", which has the gematric value of 592, or 16 x 37, thus equating to the value of "Theoths"-God. The image of Serapis was depicted as having a quarter bushel grain basket on his head as a hint perhaps that, 4 x 592 = 2368. With these concepts in mind, its time to examine the facet structure of the Celestial Bishop. As was done in the previous sections on the King and Queen, the front/side facet totals are, 14 + 10 = 24 x 37 = 888 . This value equates to the name Ihsous-Jesus, in its apparent mode, and compliments the apparent King total already mentioned as 40 x 37 = 1480-Xpistos-Christ, to make the total of both again, 2368. Or in the words found in the NT book of John; 10:30, "I and my Father are One". This concept is further enhanced by the geometric structure of the two figures, as seen in the next image in which the two are merged completely. In addition, the side facet structure of the Bishop shows the Vesica ratio, due to the overall ratio of the entire set's Front-3/Side-1 proportions. This Vesica also merges with the Celestial Queen's side structure which demonstrates the same proportion. OK, so the early Christian church fathers just downplayed this aspect in their original Nicene "Trinity" Creed, a bit. LOL! I find it interesting, that no sooner than the early Christian church had gained most favorable state religion status in the already declining Roman empire of this era, that it began to eliminate all competitive factions such as the "Gnostic" sects, who originally played a major role in developing this same religion, such as the formulation of the names of the Christian deity itself. Lets face it, this wasn't a common Hebraic name, was it? Irregardless of the official doctrines of this era however, these same gnostic traditions would continue in secret in the very fabric of the Church as it had been done for thousands of years previously, formulated into the constructions of buildings of worship on a geomantic basis. Before I elaborate on this theme further, I'd like to show another example of this process utilizing the "Actual" facet totals of the Celestial King, Queen, and Bishop as, 60 x 30 x 28 = 50400. This is a 10x. multiple of 5040 which is described in Plato's "Laws" Book V. written around 360BC. The significance of this number's use by Plato in describing an ideal hypothetical state, is stated to be it's whole number divisors totalling 59, which could be used to regulate most aspects of the populace's needs. What it actually does, is generate the radial number referred to in the section of the Alchymical Wedding ceremony concerning the combined Earth-3960Mi./Moon-1080Mi.= 5040Mi. radius system that creates the circumference value of 31680 miles, which gives the total of the Christian gematric name, Kurios Ihsous Xpistos-3168 x 10Mi. and perimeter of the square containing the Earth sphere. This example is interesting, in that these gematric name values should equate to metrological units of English miles that wouldn't be officially established for another 2000 years or so, during the period of Queen Elizabeth I around 1582AD., from the historical records I've researched. So how did this unusual coincidence occur? For starters, it goes back to the fact that the mile unit of 5280ft., is based on the ancient Saxon land measures and the acre multiple of the "Rood" or Rod of 16.5ft. x 320 = 5280ft. which had been around for those interim 2000 years, although they in turn didn't originate the system, which goes much further back in time to the Sumerian and consequently Bronze age Megalithic cultural era of Britain, another 2000 years previous. The foundation of metrology rests on what is now known as the English foot, although it wasn't known as such in that remote era. The "apparent" relationship of the Saxon/English metrological systems was the ratio of 1-English ft./1.1-Saxon ft.and subsequent cubits of 1.5-English ft./1.65-Saxon ft. This "apparent" link misled many early reseachers of ancient metrology into thinking them to be a direct connection between the two cultures prior to the Germanic Saxon invasion of Britain during the Roman era around 400AD.. The "actual" connecting link between the two cultures was determined by the contemporary metrologist and author John Neal, who began by utilizing John Michell's data in his book, "Ancient Metrology". published in 1981. He expanded Michell's initial research into a recognizable "Tree" structure formula using two distinct ratios separating similar units of measure by the fractions 176/175, and then 441/440. These two fractions or ratios were recognized by the reknown metrological researcher, Sir Flinders Petrie, who did the most precise surveys yet performed on ancient monuments such as the Great Pyramid in the late 1880's. Unfortunately, he didn't have enough available data from other surrounding culture's use of these same ratios at that time, to perform the necessary analysis to determine what they pertained to. Neal's metrological tree structure system reveals the similarity between the Saxon metrology, to be indirectly linked to the English by a very roundabout Saxon/Roman/Greek/English conversion process using the aforesaid ratios. What makes a measure "Canonical", goes back to it's qualitiy of being divisible in duodecimal units of 12, and also to decimal system units of 10. Additionally, Canonical measures and Gematric words or phrases, are linked to the Pi value of 22/7, which has been in use since before recorded history even though it is commonly given a Greek association. Canonical measures especially in the English/Greek mode, provide an intermediate step between a Root unit of the English foot, being converted to a very precise Greek geometric foot value of the Earth's mean meridian circumference measurement. In the example of the Canonical Earth/Moon mile radius system total of 5040, the diameter of the circle is a 100800mi.-1ft.:10000mi. scale of the Greek foot called the Samos of 1.008 English ft. It is computed by the two ratios referenced as, 1 x (176/175) x (441/440) = 1.008ft.. The first ratio is the difference between using the more practical but less precise unit of Pi value, 25/8 = 3.125 x 176/175 = Pi - 22/7 = 3.1428etc.. The second fractional extension is thought to be the difference between the Earth's Polar radius which is shorter than the average mean meridian radius by the ratio, 440/441 by Michell and Neal. I am thinking there is another correlation involved in this ratio's function however. Be that as it may for the time being, the Greek Geometric foot is generated from the Canonical Ft.1.008 English ft. x 176/175 again, to produce the Greek Olympian or Geodetic Foot of 1.01376 English Ft. When multiplied by 10 x 600(Greek stadia) = 1min. of latitude or a nautical mile of 6082.56 English ft., which is a mere 1.2 in. less than the current value of 6082.66ft., according to the value referenced in Dent's dictionary as mentioned by John Michell. Once again, hmm! Now that we've had our metrology/geometry lesson for the day, it's time to look at some other aspects of the Celestial Bishop. As I mentioned in the Alchemical Wedding section, the offspring of the couple was said to have an additional line of values utilizing the facet product totals of the King and Queen, plus the remaining figure's facet product total, as something of a checksum measure to the concepts imbedded into each additional design. In this case, the total of the King/Queen product of 436 added to the Bishop's product of 10-side x 14-front = 140totals 576. This value if you have been following this production's previous sections closely, was already mentioned as equating to the Greek gematric word "Pneuma", or Spirit. It is also the square of the 10-side + 14-front = 24 Bishop facet total. This number figures into the metrological formula as well, but what I find more interesting at the moment, is that it connects prominently in the Old English Imperial weight system's now abolished "Troy" units,, except for continuous usage in such valuable commodities as the metal Gold etc. These commodities are measured in "grains" ala Barleycorns literally, in which a pound Troy equals 5760 grains. The antiquity of this system is once again extrodinary. The label "Troy", is said to be derived from the medieval market fairs of Troyes, France held in the Middle ages of European history starting around 1300's throughout the era of the Reinissance period in the 1600's. But some highly unusual coincidences occur once again during the reign of the English Queen Elizabeth I, during her reforms of weights and measure standards around the year1582AD., which included the secondary system of pounds called "Avoirdupois" from the French term for "weight of goods", used for less valuable commodities which she established at 7000 grains. This is still used as the basis for the pound today, which is divided into 16 ounces. What I regarded as unusual in this case is that when the pound avoirdupois is divided into 16 ounce units, it yields a fractional number of grains at 437.5. Why set the value to give a fractional remainder of a half grain? The Troy pound system on the other hand, is divided into 12 ounces or rather, "Uncias" from the earlier Roman latin word for inches. So did this system originate from some Roman variant of the pound avoirdupois later adapted by the medieval French? They used an avoirdupois pound of 7200 grains at that time. A Troy pound of 5760 gr./12oz. = 480gr. After a bit more investigation, I learned that if the pound avoirdupois had been set at the whole grain value of 438gr. x 16 oz. = 7008gr., it would correspond to the Venus ratio cycle of 584/576-Pneuma that I mentioned in the introduction section of this presentation. It is the same as the 365/360, Earth's Time/Space ratio when converted by the Canonical factors of 10/12 to 1.013888etc.. This value is just a shade over the aforesaid Geomantic Greek foot of Mr. Neal's analysis coincidently enough. Well, perhaps the noble Queen and her councellors just weren't aware of this coincidence; "Not hardly I think!" The next thing that I determined, is that if the ratio of the two pounds as 7000/5760 = 1.2152777etc. , are converted by the Canonical factors of 10 and 12 by the equation, 1.215277 x 10/12 or 5/6 ratio = 1.01273148, it gives another value related to the Greek Geometric Mean degree of 1.01376 English ft. This geodetic foot value is not found at the halfway mark of 45* degrees latitude, but rather a bit further up around latitude 50/51 degrees, that encompasses the area of Southern England and coincidently, Avebury and Stonehenge. However,,,this 1.01273148ft. Lb.Ft. does give a precise, and I do mean precise minute of degree when multiplied by 6000 Ft.,or 6076.3888cyc.Ft.,as the 45 degrees latitude value used to define the "French? Meter" today! Hmm, maybe the good Queen Elizabeth I, just wanted to have the last laugh on the deplorable standards of the French at that time, that actually got worse during the intervening centuries up until the adoption of the Metric system which took another hundred years to complete from its first conception, and inaccurate still! LOL! But then I was to have another "Revelation", not the one found in John's Ch.6:6 that goes,,"And I heard a voice in the midst of the four beasts say, A measure of wheat for a penny, and three measures of barley for a penny; and see thou hurt not the oil and the wine. ", although that is a pretty good one that hints to the 45 degree latitude region of France called "Bordeaux". Home of the Papacy's world famous vintage wines, LOL! This revelation would go much deeper than that in time. Perhaps it wasn't the dual pound ratio that would lie at the root of the choice of a7000gr. pound avoirdupois. It was the "ounce" ratio of Tr.-480 /Av.-437.5 = (1.09714)2857 , that would provide the answer to the mystery. This ratio is once again found in John Neal's book, "All Done with Mirrors" on page 81, that gives the layout diagram of most of the ancient world culture's whole integer metrological ratio connecting links, and surprisingly enough, it looks a lot like my Celestial Bishop design btw. Perhap I can get Mr. Neal's permission to paste a copy of it in this section for the viewers to see for themselves. Until then, a quote from the page will have to suffice. "The above diagram shows how the primary feet of Mycenean .9, Roman .96, and Greek 1, together with their royal developments by the seventh part which form the "common" Greek of 1.028714, Sumerian of (1.09714) and royal Egyptian 1.14285, are interrelated by single fractions." So there lies another solution to the dual pound or rather "Uncia" mystery. It follows an indirect link from the Greek/English ft. as "One", followed by the ratio of the well known 25/24 Roman, .96ft.link, followed by the lesser well known7/8 ratio link, to the Sumerian ft. value of 1.09714. Or working backwards, 480gr. x (7/8) x (25/24) = 437.5 gr. Well that's Royalty for you! Always eccentric and unfathomable, well maybe not entirely! Hmm, did we just have another ancient metrology/geography lesson? Oh well! It's been a few years since I updated this presentation's information now, but I've only come to recognize the true significance of this 7000 grain Avoirdupois Lb. as of this Oct.,2010. As it turns out, this Avoirdupois 7000 Lb. value is connected to the Canonical diameter of the Earth of 7920 Mi. already mentioned, by the fundamental ratio of the ancient Egyptian Cubit to the English Ft. of 12/7 proportionately, although there are additional extension values to this base ratio. I've always thought there was a volumetric/weight factor involved in this fundamental ratio and there is, as far as the the two Lbs. go. The Troy Lb. of 5760 grains, also equates to the number of inches in the "theoretical" height of the GP, the famous pyramid of the Egyptian pharoah Khufu, by this base ratio x the seked Pi 22/7 value. The equation is thus: 7920 Mi. x 8/7 = 9051.42857cyc. (the side perimeter of the GP in inches) / 9000 = 1.00571428 cyc. This new ratio in turn, is the inverse multiplier of an "Idealized Equatorial Circumference" of the Earth as mentioned by John Michell in his book "The View over Atlantis", of 25,000 Mi. The inverse of the aforesaid ratio unit, gives a Polar Meridian Earth Circumference value of 24,857.95455 etc. Mi. This is the same exact value as the aforesaid Meter degree at the 45* latitude in the previous equation. Once again, is this a remarkable coincidence? I think not! What makes this latest discovery so controversial, is that the GP wasn't measured during QEI's reign, but only afterwards by John Greaves, Prof. of Astronomy and Geometry at Oxford University around 1639, at the request of Sir Isaac Newton who was studying ancient monument measurements to correlate with his new theory of Gravity. So there is a 57 year gap between the metrological reforms statute of QEI, and Sir Isaac's era in which allegedly, the Polar Meridian Circ. value of the Earth wasn't known yet. The late John Michell, as well as most current metrological researchers, were of the opinion that the ancient cultures considered the Earth to be a perfect sphere instead of an Oblate Spheroid. I'm thinking they were more astute than that however. For additional details concerning this latest discovery process I refer the reader to "GRAHAM HANCOCK MYSTERIES FORUM"
So what other gematric gifts and goodies can I put under Mr. Neal's metrological "R-Ule Tree" during this holiday season, regarding the Celestial Bishop. (I just love puns!) The introduction section to The Celestial Arena gave the total figure's in the design as a numerical facet set, being formulated according to the two primary aspects of Light, which were designated as "Refractive", or the principal of the color spectrum of 7 -Venus, whose magic square total 1-49 = 1225, is found in the side of the design's facet set total. And then the "Reflective" 9-Moon principal, whose 1-81 front facets or face total of the set, corresponds to the magic square total of 3321. Keeping in mind what I said about this design's overall structural formula as a set being "Holo"-graphic, ie, the subparts contain the information of the Whole, I can now use the gematric words and phrases generated thus far for the "Trinity" of, King-40 x 37 = 1480-"Xpistos" + Queen-"H'Xibotos Ths Diathhxhs" (Ark of the Covenant or half acre ft. total) - 2178 + Bishop-24 x 37 = 888-"Ihsous" = 4546 or, Moon-3321 + Venus-1225. "Curiouser and curiouser", said Alice in Wonderland, but it does focus a bit clearer on that passage I quoted from Mme. Blavatsky's book,"Secret Doctrine" that I gave in the Alchymical Wedding ceremony section, "Father/Mother spin a web, whose upper end is "Spirit"-Light of the One Darkness,,etc. ", doesn't it? Now frankly, after reading that incredibly large convoluted labyrinthine tome many years ago, I came to the conclusion that I learned more from looking at the front cover diagrams of the book than all of the 800 or so pages, LOL! One of those reversal cliches' on, "Don't judge a Cover by the Book". One of those diagrams may look as familiar to the reader as it does to me regarding the Celestial Bishop's overall structure. Hmm, then again, perhaps I should put this "Star", emblem on top of Mr. Neal's metrological "R-Ule Tree". The title heading above translated as "The God of the Cosmos", has the gematric total of 37 x 52 = 1924 , which is the product sum of both the "apparent" front/side total of the Bishop's facets, plus the "actual" total, or 24 + 28 = 52 x SC37. The number 52, suggests the number of weeks in the Solar year as a compliment to the Celestial King's values already described, and also represents a summary of an additional "Day" of 24 hrs. As a cyclic or circumference number, 1924 has a diameter of 612.1818etc. This value equates to the deity name most prominent in the ancient Greek pantheon of "Zeus"-612. This diameter number is half of "1224"-Ixthyes-Fishes and or "Arche Parthenos", that was described in the Celestial Queen's section. This diameter of Zeus at 612.1818etc. is the long axis of a 3Rt. Vesica, whose short axis is the radius number of "H'rmes-353.4433, described in the Celestial King's section that produces the diameter value of 706.8866 x Pi = 2220.749 etc. And so this formulation acts as yet another identity association to the creative process of the Celestial couple's "First born". It also reveals something of the nature of the ancient pantheon's previous deity names that correspond to the generative process of the later Christian deity name, Ihsous-888. It is appropriate to the design pictured above, in that the circular serpent called the "Ouroboros" in many ancient Hermetic texts is a symbol of the Cosmos in the act of self creation and destruction by devouring its own tail, or in another mode, it represents the Eternal cycle of seasons of the year. It is referenced in Plato's Timaeus 33-The Construction of the World, as well as many other culture's description of the Cosmos around the world. I am not going to give a lengthy discourse on it, except in it's associative aspects to the Bishop's design, which also alludes to the Hermetic maxim of, "That which is above, is similar to that below". Many texts associate this symbol with another concept called the "Androgyne", which denotes a unity of male and female attributes in a state of Wholeness. I regard this as meaning humanity in general irrespective of gender, which has a spiritual as well as a physical nature. It is the "Spiritual" aspect of humanity that is closely defined in the attributes of the Bishop of Celestial Chessworks, just as it is alluded to in the term "Bishop" in Chess. All of these concepts come together in the figure's gematric word associations such as the neutral form of humanity in the Greek term, "Andro"-225 (different than the gender based "Anthro"-230), plus Spirit as"Pneuma"-576 totalling 801, which as you know or read in the beginning section, equates to the word Dove-"Peristera", and also the Greek letters Alpha-1 and Omega-800 symbolizing, beginning and end. These concepts were already presented in the introduction section of the design, describing the dual aspects of the Knight whose discourse follows this one. It was stated to pertain to an inner and outer perspective of the set's overall holographic parameters. "Nous"720-Mind + "Alpha"-1 + "Omega"-800 = 1521 or 39sq. Both terms Andro-225 and Pneuma-576 are square values also, and in their reduced mode, 15 + 24 = 39. The point I am alluding to, is that this design tends to create it's own description in a self reinforcing manner. Although I am the creator of it many years ago now, I only had a vague concept or skeletal outline of all the basic parameters I was trying to create, on a conscious level at that time. Art is like that, it works on a subconscious level, which has to be brought into focus consciously and sometimes with great effort. My own knowledge and awareness of it's interpretative aspects, are due mainly to the writings and research and historical records of others, who have had many similar visionary perceptions of this Cosmos we were born into, and some day will leave through our demise. I tend to reserve the idea that our physical demise will only be on the lower planes of the realm of Celestial Chessworks figures, yet to be described. I have tried to present these concepts in an orderly and cohesive manner as I can. No doubt some who read this work, who have been raised in a more "traditional" mode of Christian religious perceptions will perhaps be a bit disturbed by the contents of this presentation, but I hope not. I find nothing wrong with traditional perceptions, except when they tend to exclude the perceptions of others. I try to be as light hearted in my approach to this descriptive process as possible, and make a few wisecracks, puns, and spoofs regarding it and the works of others sometimes, but not be frivolous when it comes to the sentiments and spiritual feelings of others. I could continue to write more concerning this figure of the design, although I think the reader has enough information to get the general idea of it from what I've written so far. 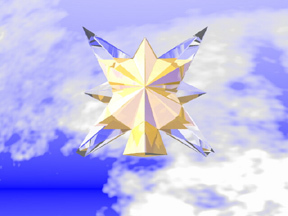 Of course, it will be referred to in the coming figure's descriptions as well because basically they are all merely, "Etera-Other" aspects of the "Auta-Same",,"Ousia-Essence". Copyright Celestial Chessworks Inc. The production entitled "The Celestial Bishop", was completed on and around the holiday season of Christmas 12/2004, Happy Holidays!